I’ve been really looking forward to chatting to you a bit more about the Mini Tania culottes. This pattern is very close to my heart because it’s the one my eldest daughter requested most often. In fact i would almost term it nagging hehe. But you know what, she was right. The only thing more awesome that Tania culottes are Mini Tania culottes. I adore them. I’ve replaced all of the skirts in her wardrobe with culottes, thats how much we love them. So as with the Mini Briar, today i’ll share a little more about the development of this pattern – and if you have any questions, let me know in the comments! I’ve basically answered this above, but these adorable child size versions of my popular Tania culottes sewing pattern, are 100% inspired by my Bunny. I made these at her request, and that began the entire collection of Mini patterns. I think they’re perfect for an active child – which is what my eldest girl is. She is girly, and loves skirts – but she also loves to run, and jump and do crazy stuff. Skirts don’t allow her to do that modestly – culottes are the answer to the cute vs practical debate. This was probably the shortest development timeline of all the Mini patterns – or at least it felt that way hehe. Probably because i started it first. Much like with the other patterns – I used all my friends and neighbors little ones as my fit models – and it was so exciting to see how much mother’s and kids love this design. Little girls love it because it feels like a skirt – and mothers love it because it solves the problem of our adorable girls flashing their undies to the whole world every time they play hehe. Though the overall design and function are the same as the adult Tania’s – i had to make a few changes to make them kid appropriate. There are no zips in this version, and no fitted waistband. Instead i opted for a comfortable elastic waistband which can be customized to a child’s preferences. 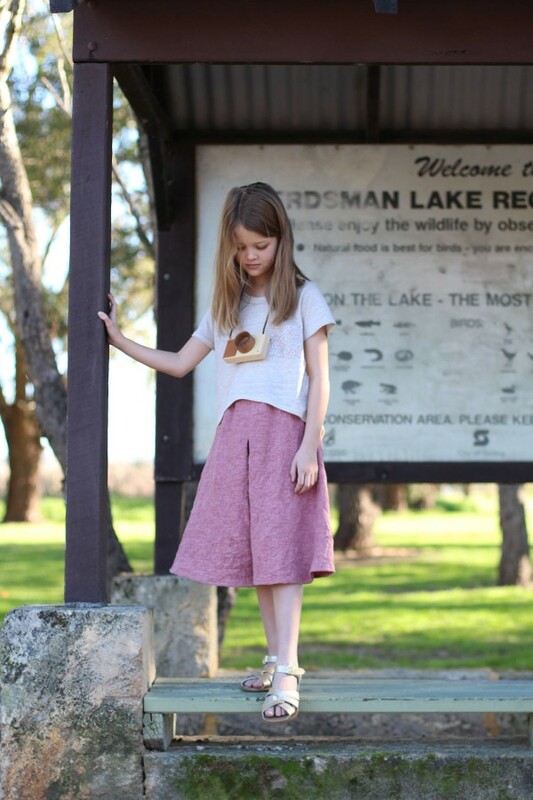 I kept the variations for this pattern the same as the adult version – there are three versions – shorts, knee length and midi length. Though, I must admit that at first i wasn’t going to include the midi length variation – i wasn’t sure kids would like it. But turns out they love it! HA! I think it’s awesome when i’m wrong – and it’s really shocked me to find that the variation my Bunny wears most often is the midi length. Go figure! There is a lot you can do with just these three versions – but you can add your own ideas too! One of our pattern testers added her own pockets – some added pom pom trim to the hemline. We’ve even got a really awesome tutorial coming up soon for a variation you’ll never guess (seriously you won’t guess, and it’s awesome). I would also like to try combining these with a top to make a cute romper! The fit on these is very generous and comfortable. As the base of the culottes are much like a circle skirt, they feel very free and unconstricted – but the waistband is fitted which gives it structure. We provided suggested waistband elastic measurements, but it’s so easy to adjust this to your child’s preferences (and i recommend you do!). The shorts length are obviously short – and the rise on these is a little shorter than in V2 (knee) and V3 (midi) to make sure they are modest. The knee length should hit just above the knee, and the midi length at about mid calf. 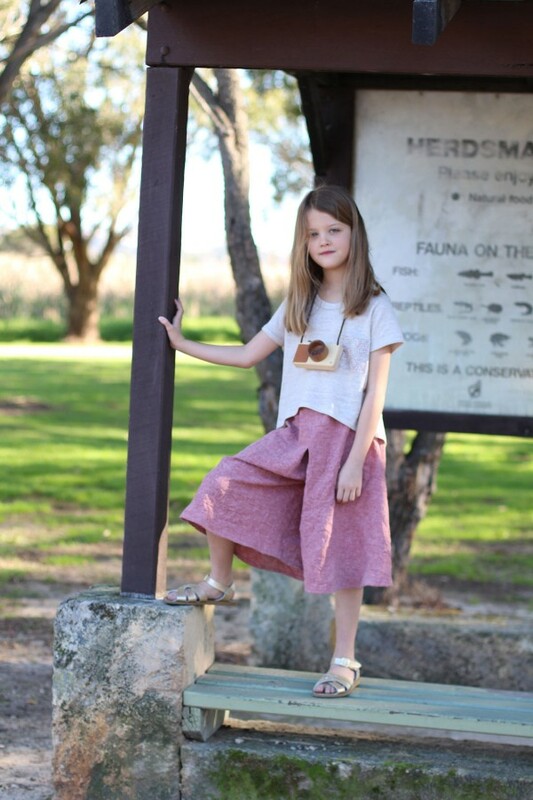 Given the design of these you shouldn’t have to make many alterations other than perhaps the length of the culottes if your child’s preferences lay outside the provided lengths. Since the waistband is gathered with elastic you can make the fit tighter or looser depending on how your child likes things to fit. Just remember to always check the elastic for comfort before permanently closing up the waistband. As with the adult Tania’s, if you need to alter the length of the culottes i do not recommend slashing and spreading. Instead, lengthen and shorten at the hemline. You might find it easiest to cut the length of a different size and see if you prefer that. Most of our pattern testers found the standard lengths provided to be just right. Hot tip! I would recommend adding a little something to the front (like a bow) or back (like a name tag) so that it’s obvious to them which way round the culottes go on. Though the front and back look quite similar to a child, they are obviously different in fit, so they won’t look right or feel comfortable if they’re on backwards. I love styling the Mini Tanias! They look amazing with pretty much everything. Obviously i love them with a cropped Mini Briar, but they work equally well with a longer Mini Briar or a standard tee. I also love them with a leotard – Bunny has this one and loves wearing it with her culottes. 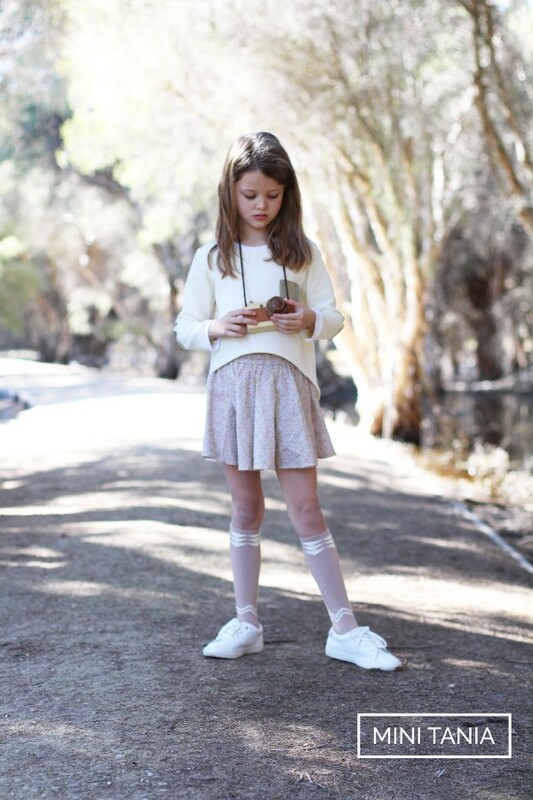 This is one of those pieces that works well tucked or untucked – which is great for kids as you can let them choose how they want to wear them! For winter I love the idea of using a heavier wool for warmth – and summer they’re perfect in a floaty cotton or linen. Liberty prints are particularly awesome, the fabric weight works beautifully with the Mini Tania’s (i’ve made three!). So tell me what you think?! Do you love it as much as i do? 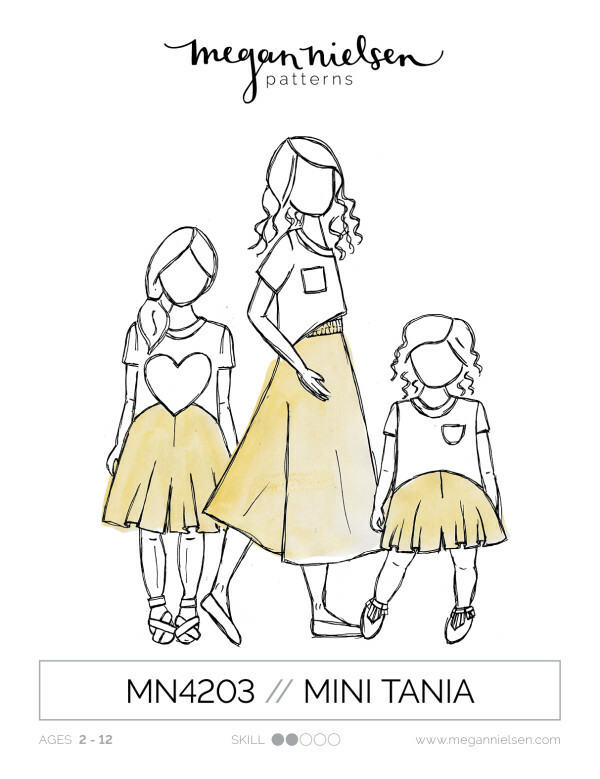 The Mini Tania is available now in store in both paper format and PDF format, and don’t forget to check out the #MNminitania tag on Instagram for inspiration from other sewers! If you have any questions at all about this new pattern let me know in the comments! Will the new patterns be added to the app? Or have they already been added and I just need to update things somehow (totally possible!)? I don’t often sew for my kids, but these are so cute that I am already turning over in my mind what to make for them. I love the new patterns! We’re working on getting them in! We are going to have to release an app update to include the kids patterns, so right now we’re doing all the final checks before we resubmit to the app store :) I’ll do an announcement when they’re in. Sorry for the inconvenience!